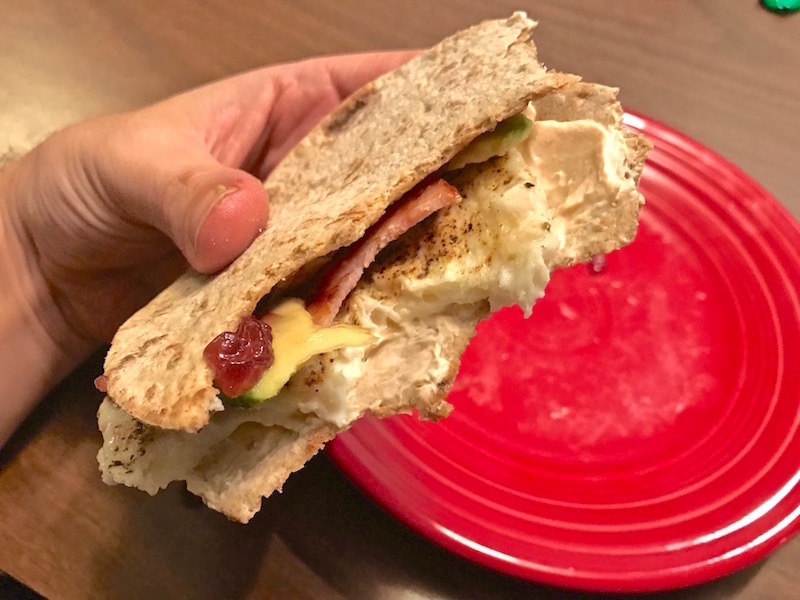 Kathy Griffin Inspired This Totally Delicious Breakfast Sandwich | Keep It Up, David! I love Kathy Griffin. She’s hilarious and I’ve been a fan for decades. I’ve been getting my Kathy fix lately, because she’s been making the talk show rounds, promoting her new book, which I can’t wait to read but haven’t bought yet. 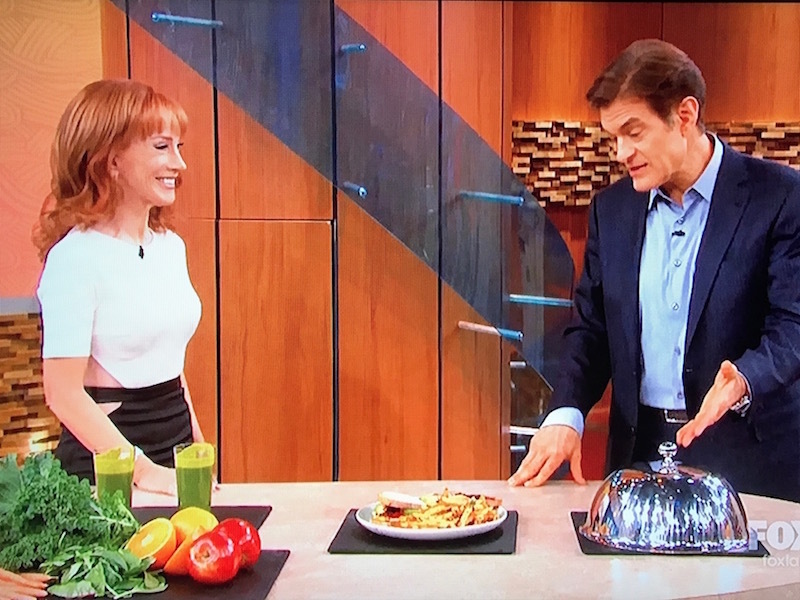 She was on The Dr. Oz Show yesterday, where she talked about what she eats, because she’s the healthiest she’s ever been. Kathy talked about her favorite salad and green juice, and then talked about her favorite sandwich, which she likes to eat at midnight, after a stand-up gig. 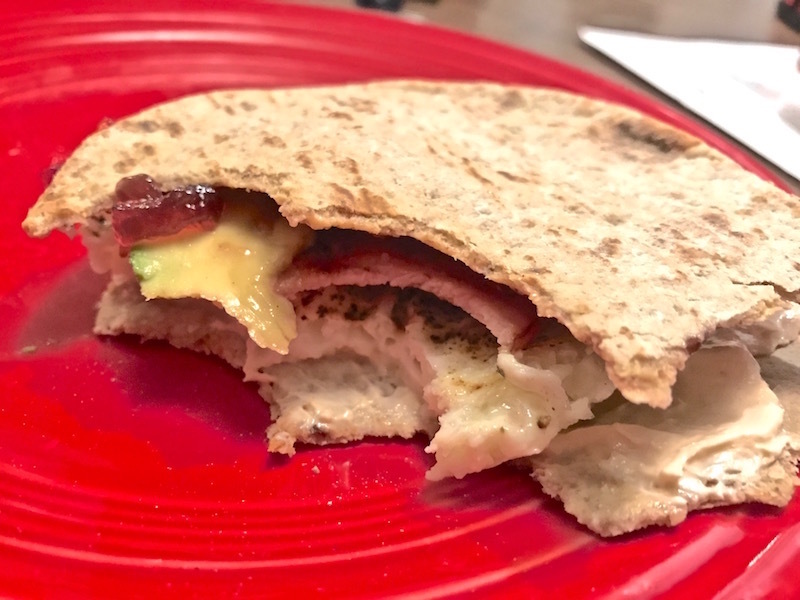 Egg, cheese, turkey bacon, avocado, and blueberry jelly. My ears perked up – it sounds incredible! I put a short clip of her discussing it on my Twitter feed, watch it here. First, the bread. Kathy didn’t specify what kind of bread she uses, but I love Foldit bread, made by Flatout. Each one is 90 calories and it’s the perfect size for a sandwich. 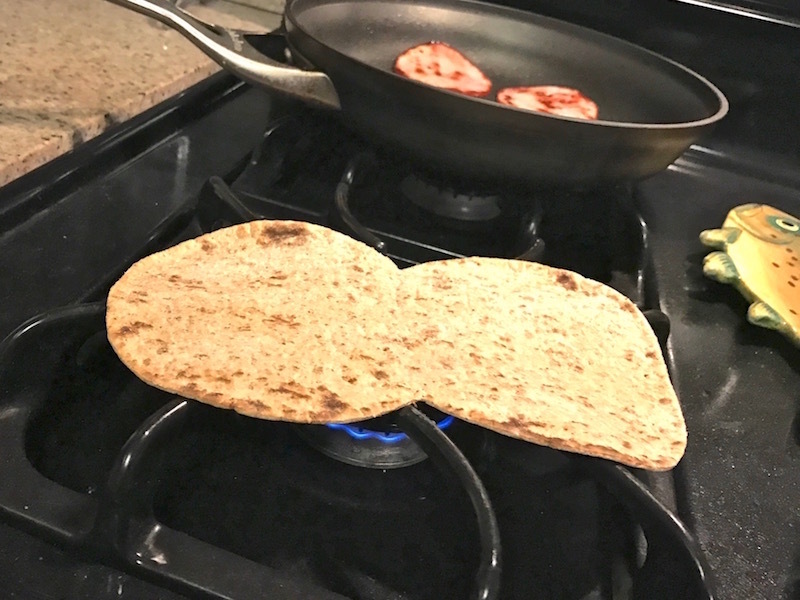 I like my sandwiches toasted, but these don’t toast well in my vertical-slot toaster, so I put one Foldit flatbread directly on my gas stovetop, over super low heat, so it would warm up and get nice and soft. It only takes a minute or two on each side. Keep the heat low so it doesn’t burn. You can see, in the back, that I have two slices of Canadian bacon hanging out in a skillet. I happened to have this in my fridge, and it seemed like a good substitution for turkey bacon. Each slice is only 20 calories! I just “fried” it, using a little cooking spray, to warm it up and get a little color on it. While the Canadian bacon was cooking, I nuked two egg whites in the microwave. 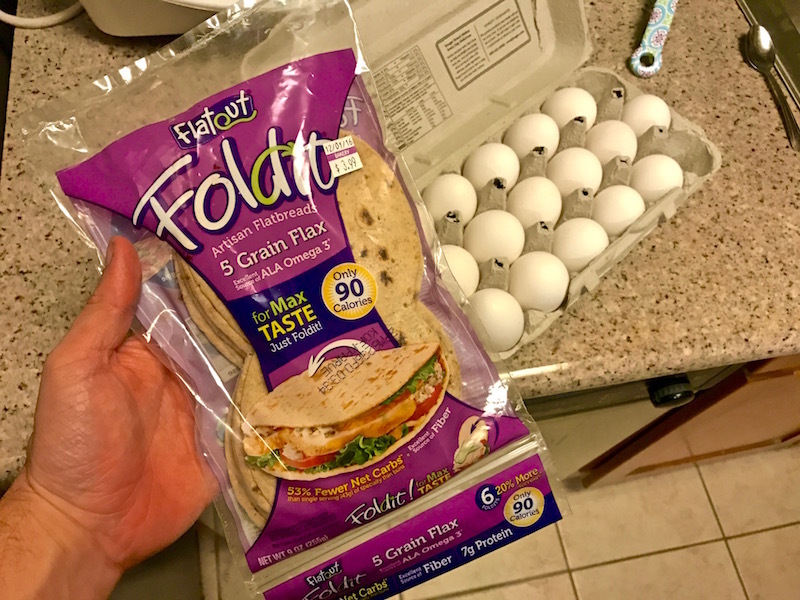 I cook eggs on the stove all the time, but for this, I wanted the eggs to fit well in the sandwich, so I slicked a cereal bowl with cooking spray, and cooked them in there, since the bottom of the bowl is almost exactly the same size as half of the Foldit. I added some black pepper and Mrs. Dash since egg whites can be a little bland. I always nuke eggs at 50% power, so they don’t explode all over my microwave. Two minutes at 50% was all these egg whites needed. See how nicely it came out? Next ingredient: cheese. I rarely keep cheese in my fridge, because I have a tendency to eat an entire package in one sitting. I don’t have that problem with cream cheese, though, and I already had some on hand. 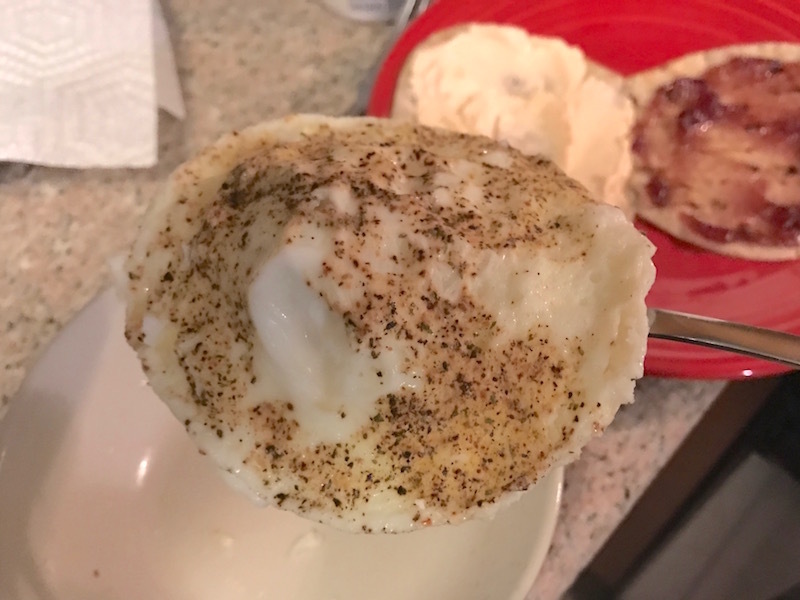 It was smoked salmon-flavored cream cheese – which I mix into scrambled eggs all the time. 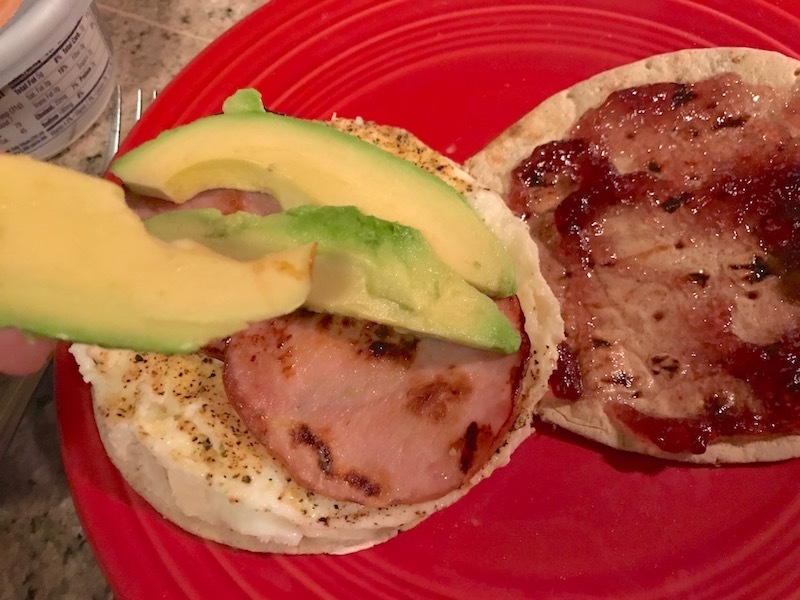 Then I added the egg and Canadian bacon, and topped it with 1 ounce avocado (which was 3 slices, about 1/4 of the avocado I had ripening in my fruit bowl. That’s it! Sandwich done! It’s not as pretty as the sandwich on TV, but let me tell you, it’s delicious. Savory and sweet, just like Kathy told Dr. Oz, and with a variety of textures, too. 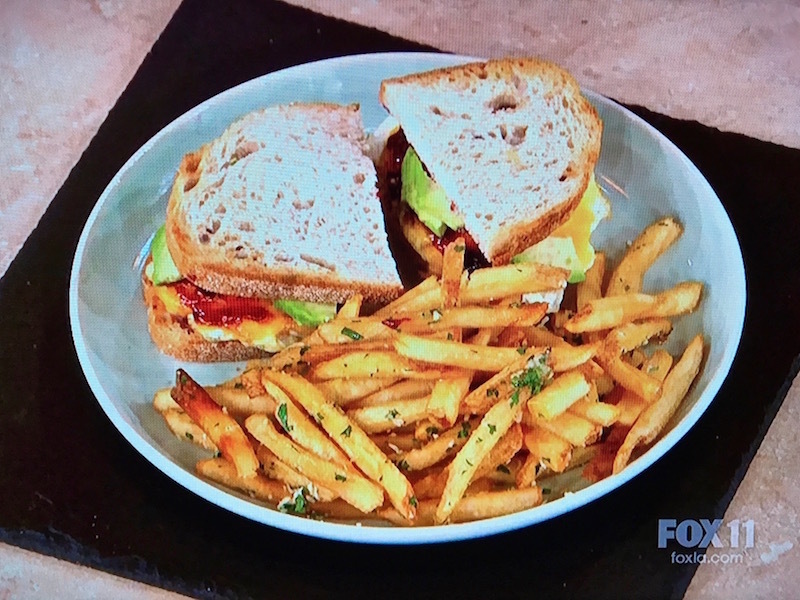 I don’t know the calorie count of Kathy’s sandwich, mostly because she didn’t specify quantities, but my version has 281 calories. It also has 23.5 grams of protein (that’s a lot for a little sandwich), 10.5 grams of fat, and 30 grams of carbs. This is definitely a great way to start the day. Or, in Kathy’s case, end it. Hell, you can enjoy it any time of day! Check out tons of healthy recipes on my Recipes page. This entry was posted on Tuesday, November 29th, 2016 at 1:24 am and is filed under Uncategorized. You can follow any responses to this entry through the RSS 2.0 feed. You can leave a response, or trackback from your own site.